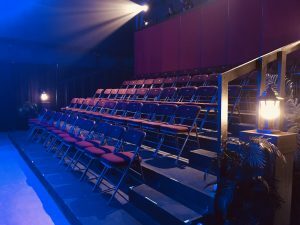 Our mission at Kensington Theatre is to give our community quality, family-friendly performances in theatre and to provide education and performing opportunities for children and adults to participate in theatre in a meaningful way that fosters self-esteem, respect for others, cooperative interaction, and commitment to family values. How Kensington Theatre Company was created is a really cool community story! It began back in 2007 when Toni Butler approached the Daybreak Community Council to put on The Wizard of Oz. They agreed and it was a tremendous success involving over 200 community members and performed to sold out audiences! The community thirsted for more… so Toni and the adults in The Wizard of Oz formed Daybreak Community Theatre, an independent community theatre. South Jordan City wrapped its arms around our company and encouraged a name change to reflect the entire community our company served. So, we became South Jordan Community Theatre and opened our first season with Peter Pan! After seven seasons, we moved into an exciting new theatre! We are also changed our name to Kensington Theatre Company! Kensington Gardens is where Peter Pan also began his adventures. His mantra “I am youth, I am joy, I am freedom!” is also what we at Kensington Theatre also celebrate. So, Kensington became a natural and charismatic fit for us! This change in name for our seventh season also marked the first production we produced in the new theatre at Early Light Academy. We are very young, but very ambitious and driven by our talented community. Be sure to keep your eye on our theatre company; a company that continues to exceed everyone’s expectations of community theatre! While we are called Kensington Theatre Company, Daybreak Community Theatre is still our parent company name. My favorite part of directing a play is the curtain call. That is why I love our logo for Kensington Theatre; it is a curtain call with people of different ages and sizes, holding hands, united in one amazing experience: Theatre! Our casts go away with a new family that they will always be tied to. Theatre is more than entertainment. It truly builds character and community in a way that is seldom matched. 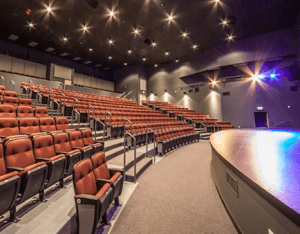 Check out these videos to see where Kensington Theatre came from an why it is pretty much the greatest thing since stadium seating (which our new theatre has!! ): South Jordan Community Theatre Vision and I Didn’t Expect That!